9 Bedford Row International (9BRi) has launched the Libyan National Council for Civil Liberties and Human Rights - NCCLHR Partner Project as the first project to focus on business and human rights in Libya through the independent Libyan human rights organisation. It is authored by David Hammond, UK Counsel to the NCCLHR and has been released to European Institutions in Brussels following the recent NCCLHR Delegation visit (11-13 Feb 14) to the European External Action Service (EEAS), European Commission and European Parliament. 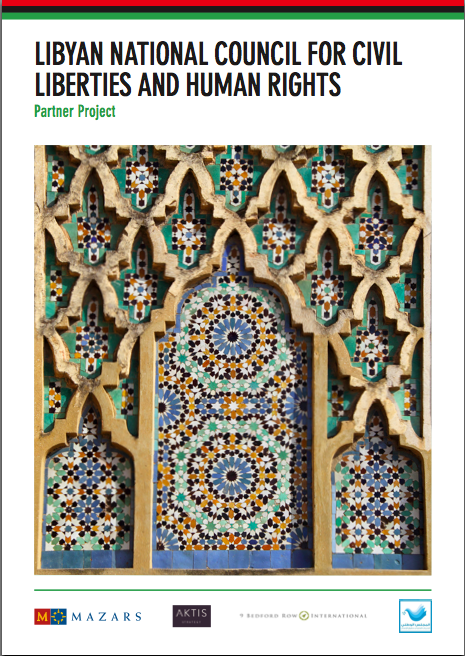 The Partner Project is focusing on continuing expansion of both legal and commercial expert support for the institutional development of human rights across the criminal, civil and commercial areas in Libya in support of and on behalf of the NCCLHR. The main effort for 2014-2015 will be the expansion of the newly introduced work area of business and human rights led by Mazars LLP, while the Project includes concurrent expert development support for international human rights training and awareness for NCCLHR staff by 9BRi and Aktis Strategy Limited. Mazars LLP, an award winning international accounting firm specialising in business and human rights and Anti-Bribery and Corruption. Mazars LLP, through its London and Tripoli offices, is responsible for developing NCCLHR auditing and governance practices, Anti- Bribery and Corruption implementation and developing knowledge in relation to business and human rights. Aktis Strategy Limited, a specialist strategy consultancy with expertise in institutional development and rule of law reform in fragile and conflict- affected states. Aktis is already engaged in projects to reform Libya’s security and rule of law institutions and brings to bear world-class expertise in how to build robust institutions via professional development and training interventions. The Project will deliver an outcome approach achieved through a number of individual human rights programmes. These have been designed to work either independently of or concurrently with one another, in order to provide maximum flexibility in approach for eventual successful delivery. Individual programmes cover NCCLHR Anti-Bribery and Corruption development and training, NCCLHR Human Rights in Business mentoring and knowledge development, an NCCLHR internal “Train the Trainers” and NCCLHR Community Engagement and Awareness Raising Capacity Building programme and a NCCLHR Continuous Professional Development (CPD) programme to assure medium to long-term NCCLHR professional knowledge development. All programmes are aimed at supporting long-term NCCLHR sustainability for the benefit of the State of Libya and Libyan society through confidence in working with and through, the NCCLHR. The establishment of integrated, expert legal and commercial support to the NCCLHR for the evolution of and support of a self-sustaining, measurable and recognised independent civil liberties and human rights official organisation in Libya; one which is nationally and internationally recognised, readily accessible to and used by the Libyan society based upon confidence in representation, transparency of process and accountability to the international human rights community. As part of the Partner Project, the NCCLHR formally adopted the United Nations Guiding Principles for business and human rights (UNGP) otherwise known as the “Protect, Respect and Remedy Framework” through a “Declaration_of_Adoption_of_UN_Guiding_Principles” as drafted by David Hammond of 9BRi. This is the first time that a North African human rights’ organisation has adopted the UN “Protect, Respect and Remedy” framework.